After The Hangover Part II banked almost $600 million globally, it became clear that the film would earn a third and final chapter. Creator/director Todd Phillips told anyone who would listen the last film in the trilogy would feel drastically different. The Hangover Part III has landed and it is in fact quite different and Movie Fanatic has to salute him for the effort, but is that enough? It’s established immediately that months have passed since the gang’s zany adventures in Bangkok and Zach Galifianakis’ Alan has stopped taken his meds and has gone a little off the rails. As shown in The Hangover Part III trailer, he has bought a giraffe and caused a serious traffic snarl in L.A. because of it. After the incident, Alan’s family has had enough. They get his brother-in-law Doug (Justin Bartha) to convene his friends (Ed Helms’ Stu and Bradley Cooper’s Phil) for an intervention to take him to a “rehab” facility. Once he agrees, they hit the road as a Wolfpack to take Alan to get help. Only, John Goodman’s gangster Marshall has other ideas. After causing their car to crash, he takes Doug hostage and demands the remaining three “wolves” find Mr. Chow and bring him to Marshall or their friend will die. Immediately, The Hangover Part III has simultaneously established itself as still one of the highly successful franchise's films, yet it is clearly in a different vein than its predecessors. This is more a crime comedy, action adventure than a figure out what happened the night before Hangover movie. Fans of the series will likely be slightly disappointed in the latest installment. The trademark Hangover humor is still there, but by going in this different direction, the film suffers slightly. And by this point, all the actors and filmmakers know these characters and their world so well, that the film feels as if it is on autopilot when it should be driving as fast as those cars seen from the Fast and Furious 6 trailer, also arriving this weekend. The gang adds another locale to their misfit adventures, Tijuana, where they first find Chow. But, that visit is short-lived. The centerpiece here is The Wolfpack’s return to Las Vegas. They are on a mission to get Chow and, in turn, get Doug. At this point, the film treads over familiar territory, minus the charming and banging headache of a Hangover. 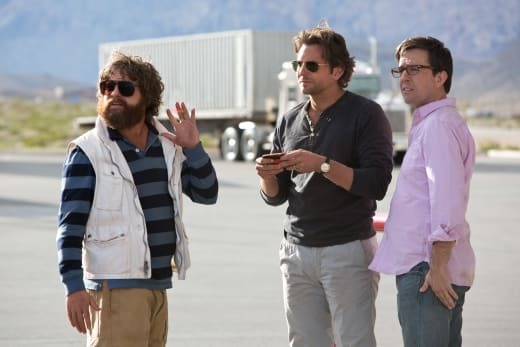 Why audiences will enjoy The Hangover Part III is simple: The chemistry between the three leads. There is something about Cooper, Helms and Galifianakis that still utterly charms us. Although their adventure this time out seems a bit of a stretch, witnessing the “three best friends” -- as Alan calls them -- getting together one more time is still an honest treat. Also, the new additions to the series are both solid. Melissa McCarthy plays a whacked-out love interest for Alan (brilliant casting) and Goodman’s gangster is fierce, but also knows when to play it for funny. By the end of the film, our The Hangover Part III review has to state that it may be time to put a cork in this franchise. Filmmakers have promised that “this is the end.” But, given the scene that appears midway through the credits… we’re not so sure.